The Beach Boys are one of those rare musical acts where they’ve been around long enough, prolific enough, and most importantly good enough to say that everyone probably likes something they’ve done. Even if you’re not a diehard fan, you have to at least tip your cap to the sheer songwriting genius of Brian Wilson. His intricate song structures, diverse instrumentation, and carefully arranged vocal harmonies were so far ahead of their time that people are still having trouble keeping up with him – and Pet Sounds came out 45 years ago. If any pop or rock musician had earned the right to call his music “teenage symphonies to God,” Brian Wilson was that man. But we’re not here to talk about Brian Wilson’s Beach Boys. That band was one of the greatest of all time. No, we’re here to talk about what that band eventually became after Brian’s drug problems and mental illness sadly phased him out of the picture. By the late 1980s and early ‘90s they’d completely abandoned nearly all traces of their classic sound, creating some depressingly lousy music in the process. Seriously, I was shocked to discover just how far this band had fallen. But I guess that’s what happens sometimes… When Bad Songs Happen To Good Bands. So where have I been for, like, all of 2010? Looking for jobs, mostly (PLEASE PLEASE PLEASE SOMEBODY HIRE ME, I PROMISE I’LL BE GOOD AND I WILL LOVE YOU FOREVER), and also writing and recording my own songs just for fun. I might even share them on the Internet someday after I get over my crippling lack of self-confidence! Hooray for me! Anyway, the 2011 Grammy nominees were announced recently and this gave me inspiration to make my long-awaited, much-anticipated (by absolutely nobody) return to the blogosphere. Of course, this isn’t a complete Grammy preview — I mean, there are 109 different categories and I’d have to be crazy to cover them all. This isn’t even a complete preview of all the awards people actually care about, just the ones I was able to write about in an entertaining fashion. The Listen Up! 2011 Grammy Awards That You Care About And That I Was Also Able To Make Jokes About Preview continues after the jump! Not that this means I can’t be satisfied with the music I have, of course. So, since it’s been another lengthy hiatus from the ol’ blogosphere for yours truly, I figured I’d ease myself back into the fold with another Colin’s Collection post. Besides, there’s a big snowstorm coating my neighborhood with icy white powder and blocking off the doors with little walls of ice. 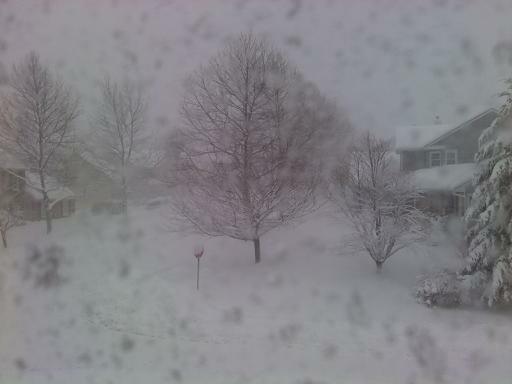 And since shoveling efforts will prove to be quite futile until the storm stops, I’ve got nothing to do at the moment. The view from my window as I write this. Where's Mr. Plow when you need him? But anyway, rather than making this all about the big snowstorm that’s been pounding the Northeast US all day, let’s get back to the point of this post: recent additions to my music collection! You can find them after the jump. Yeah, that’s right. This is now a classical music blog! And we’re going to start this new era of blogging by celebrating the life, music, and all-around awesomeness of Wolfgang Amadeus Mozart, one of the greatest child prodigies ever known to man. The guy had such a good ear for music that by the time he was, like, five years old he could listen to someone play a piece on the harpsichord and then sit down and play it himself note for note. That’s pretty remarkable talent, man. Plus, you know a classical composer is awesome when he’s got movies, ’80s one-hit wonders, and Simpsons parodies of said ’80s one-hit wonders inspired by his greatness. I LOVE YOU, DOCTOR ZAIUS!!!!!!!!!!!!!!! Okay, so I’m not actually going to start writing about classical music on this blog. It’s still the same rock/indie/metal/etc. blog as always. I’m just in a goofy mood at the moment. Not that you’d know this from looking at me, because I am sitting alone in my apartment on a Saturday night typing all this while the rest of the world is having fun without me. I’m 23 years old and I’ve already apparently forgotten what it’s like to be young… or maybe I just don’t feel like cramming into bars that are already so stuffed with people that I can’t get from point A to point B without taking a detour through points C, D, E, F, G, H, I, J, K, L, M, N, O, P, Q, R, S, T, U, V, W, X, Y, and Z, not necessarily in that order and also allowing for possible repeats. And yes, I only named all the letters between C and Z for additional effect. Just be glad I didn’t start getting into the Greek alphabet, or all those letters Dr. Seuss made up in On Beyond Zebra. Not pictured: Spazz, Floob, Zatz, Jogg, Flunn, Itch, Yekk, Vroo, Hi!, and that one that combines all 26 "normal" letters. Anyway, now that I’ve gotten my little mini-rant about the College Park bar scene off my chest, it’s time for my not-so-weekly Picks Of The Week! You can find them all after the jump. I said a hip hop a hippie to the hippie to the hip hip hop and you don’t stop the rockin’ to the bang bang boogie the up jump the boogie to the rhythm of the boogie, the beat! Now what you hear is not a test, I’m rappin’ to the beat! And me, the groove, and my friends are gonna try to ENJOY THE GENIUS. See, I am Colin F. and I’d like to say hello! And I don’t know the rest of the words ’cause it’s the longest rap song ever. In this edition of ENJOY THE GENIUS, we’re going to take a look at some true hip-hop legends. And anyone who’s familiar with ENJOY THE GENIUS by now should know that we won’t be looking at folks like Public Enemy or Run-DMC or 2Pac or Dr. Dre or the Notorious B.I.G. or Jay-Z or the Roots or Nas or Eminem or any of those guys. No, today we’re going to celebrate some of the less celebrated visionaries of the genre. Dig this blender! Rainbow suspenders! Speeeeeeeeeeeeeend some dough at table three! So you’re probably wondering how the hell I haven’t gone broke yet. And to be perfectly frank, so am I. Thank God for CD + Game Exchange — you can get used CDs for super cheap. I once got nine (9!) albums there for a whopping total of $54. You can’t even buy half that much music anywhere else for $54. I got two of them for my birthday in September and three of them just the other day as a late Christmas present for me. If there’s one thing I know how to do, it’s make myself happy. The 15 Most Disturbing Illustrations From "Scary Stories To Tell In The Dark"